These free Golly, Doll, Teddy, Toy and Novelty knitting patterns have been carefully selected for your enjoyment. A knitted Bunny that is a jointed stuffed toy, which is approximately 20” high (standing, including ears). It includes a pouch to hide sweet treats and an optional pompom tail. Click here to view the Berroco "Bunny Rabbit" free knitting pattern. A sweet, cuddly teddy bear - he looks kind of mischievous, and friendly at the same time! He's 12" tall and made from a single ball of Berroco's velvety chenille yarn, Chinchilla. The pattern is simple to knit. The body is knit in two pieces, a front and back and shaped with short rows. The pattern includes a really clear instruction on how to do W&T so you could easily make this bear if you are a beginner. It is a bit hard to see your stitches using Chinchilla though, and if you drop a stitch, you can almost forget about getting it back. Click here to view the Berroco "Harry Bear" free knitting pattern. A nice fluffy sheep! This is a realistic sheep with a smooth, stockinette-stitch face, garter-stitch feet, and a loop-stitch body (loops or bobbles seem to be pretty standard for sheep bodies). 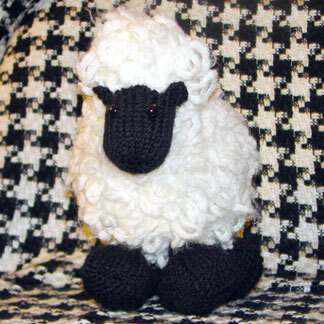 Click here to view the Gritty Knits "Woolie the Ewe" free knitting pattern.